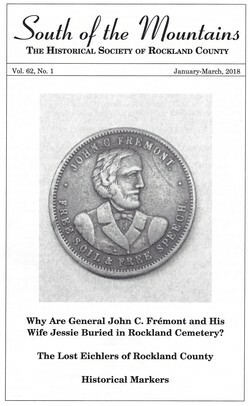 Why Are General John C. Fremont and His Wife, Jessie, Buried in Rockland Cemetery? Michael Nevins, M.D., practiced internal medicine and cardiology in Bergen County for more than four decades until he retired and moved to Piermont. This is his third article for South of the Mountains. Information about his published books on medical history can be found at michaelnevinsmd.com. Marie Monteagudo, M.A., M.A., M.L.S., has been researching and photographing historic sites in Chestnut Ridge since 2014. Her passion for documenting local history stems from over 25 years of expertise in public and academic libraries. In 2017 she published a photo-essay, "Historic Treasures of Chestnut Ridge," and worked with the HSRC on a bus tour of the village. Two new historical markers are dedicated in West Nyack. COVER PICTURE. This 1856 campaign token, a little larger than a quarter and showing the head of John Charles Fremont (and an American eagle on the reverse) is in the collections of the Historical Society of Rockland County, a gift of Miss Jessie Benton Fremont, granddaughter of John and Jesse Fremont. On July 9, 1960, the Tappan Zee Historical Society, predecessor of the Historical Society of Rockland County, commemorated the 70th anniversary of General Fremont's death. Miss Fremont and her sister, Juliet Fremont Hull, attended the commemoration. "Free Soil & Free Speech" was a slogan of the 1856 Republican Party presidential campaign.